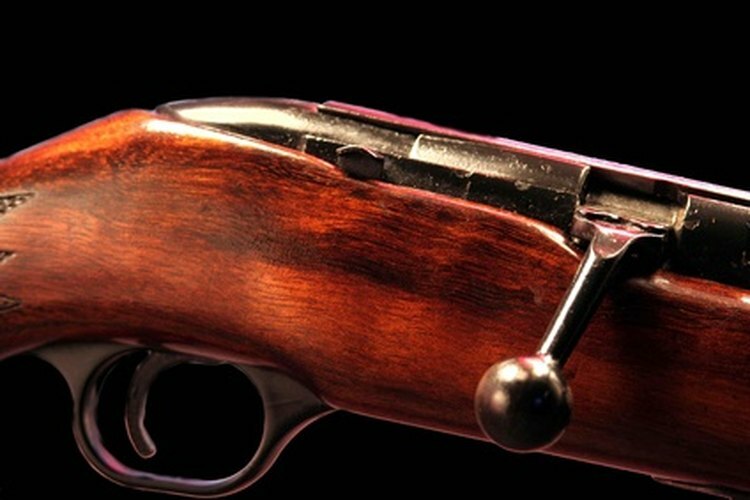 The Crickett 22 is a bolt action rifle, like the one here. The Crickett 22 rifle is a popular first gun for young kids just starting to shoot. It is a single shot, bolt action rifle. Proper maintenance of the Crickett rifle involves cleaning and oiling the barrel and bolt assembly. In order to clean the Crickett, the bolt must be removed from the barrel and brushed clean with a stiff wire brush. Check the chamber by lifting the bolt upward and pulling it back. Look inside to make sure that the rifle is unloaded. You do not want to attempt to perform any cleaning or maintenance on a rifle if it is loaded. Close the bolt by pushing it to the right and forward. Lift the bolt handle upward and pull it to the rear of the rifle. Pull the trigger to the rear as if you were firing the rifle and hold it. Slide the bolt to the rear while you are holding the trigger and the bolt will come off of the receiver. Inspect the bolt that has been removed for rust or corrosion. Gently brush debris away; do not insert the brush into the interior of the bolt as you may damage the firing pin. If the bolt is damaged, you will need to have a replacement bolt on hand. Place the new bolt into the receiver and pull the trigger back. Slide the bolt forward and move the bolt handle to the right to lock into place. Release the trigger and the rifle is now ready for firing.